VietNamNet Bridge – Khanh Ly, one of the most famous overseas Vietnamese singers, will sing in Hanoi this May, for the first time since she left the country in 1975. She is scheduled to do only one show. Khanh Ly and Trinh Cong Son. The "Live Concert Khanh Ly" will be held on the evening of May 9, at the National Convention Center in Hanoi, with the participation of three overseas Vietnamese guest singers, Tuan Ngoc, Thai Chau, and Quang Thanh, and a local vocalist, Ha Anh Tuan. In the show, Khanh Ly will perform her greatest hits. The highlight of the night will be songs by late musician Trinh Cong Son. The show is organized by Dong Dao Entertainment Ltd and Viet Vision. Khanh Ly, born in 1945, has been praised as the best performer of songs by Trinh Cong Son, the most famous Vietnamese musician in modern times. Ly left Vietnam for the US in 1975. Since then she has returned home twice, but did not perform. In 2011, the late musician Pham Duy hinted about the possibility of Khanh Ly’s return to sing at his 90th birthday concert, but the singer was unable to accommodate his wishes. In September 2012, Vietnamese authorities granted Khanh Ly permission to sing in Vietnam and licensed Dong Dao Entertainment to organize her shows in Hanoi, HCM City and Da Nang. However, for various reason, nothing came of it. Khanh Ly, born as Nguyen Le Mai on March 6, 1945 to a traditional family, grew up in the northern regions of Vietnam. As a child, she would fall asleep to her father's soothing voice. His serenades planted inside her a love for music, which grew stronger every day, albeit against her family's wishes. Her musical career did not officially begin until she debuted at Club Anh Vu on Bui Vien Street in Saigon when she was only 17, in 1962. At that point, she adopted the stage name Khanh Ly, a combination of Khanh Ky and Yeu Ly. Both are characters from Three Countries, her favorite novel. By the end of 1962, she had relocated to Da Lat and stayed there for four years, performing at various clubs and resorts. On a rainy night in 1964, she met Trinh Cong Son, at that time a young composer, at a club in Da Lat. They became fast friends. Fascinated by her seductive voice, Trinh asked her on several occasions to accompany him in his performances in Saigon. Unable to tear herself away from the romantic hills of Da Lat, she declined. 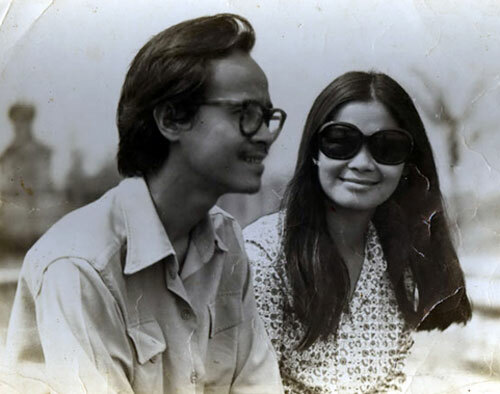 During a trip to Saigon in 1967, she ran into Trinh on the busy street of Le Thanh Ton. After several serenades and coffee at a small shop called Quan Van, the legacy of Khanh Ly and Trinh Cong Son was born. Over the next several decades, Khanh Ly and Trinh Cong Son sang together at small coffee shops, clubs, and even on the steps of Van Khoa University in Saigon. During the escalation of an unwanted and bloody war, his anti-war lyrics in the Yellow-Skin Songs and her luring voice appealed to those who grew weary of the battles and bloodshed. Their plea for peace propelled them to the top. From the campuses of large universities, to the unknown and endless farm lands, she was heard, known, and hailed as the "Barefoot Queen". Together, Khanh Ly and Trinh Cong Son took the Vietnamese music world by storm. Their phenomenal fame gave her the chance to be the first Vietnamese woman to headline her own show. Up until her emigration in 1975, Khanh Ly achieved disproportional fame around the world. She opened Club Khanh Ly on Tu Do Street in Saigon along with a small shop named Hoi Quan Cay Tre, a gathering place for musicians and students alike. She also performed in the United States, Canada, and Japan at the Osaka Fair in response to an invitation from Nippon Columbia Label (a large production company). Here, she recorded an album, featuring Trinh Cong Son's songs, Diem Xua and Ca Dao Me (sung in both languages), which went gold shortly after its debut. These songs became top hits in Japan and remained so for several decades. Khanh Ly was the first Vietnamese singer to achieve international fame. She now lives with her family in California, USA. Khanh Ly has four children: two boys and two girls, all grown up. Before Khanh Ly, many overseas Vietnamese artists of several generations have returned home to sing for the Vietnamese audience, including Elvis Phuong, Duc Huy, Tuan Ngoc, Le Thu, Giao Linh, Che Linh, Tu Cong Phung and Huong Lan. Younger artists such as Nguyen Cao Ky Duyen, Phi Nhung, Linda Trang Dai, Truong Vu, Quang Le, Hoai Linh, and Jimmii Nguyen perform regularly in Vietnam.